Chicago, IL – This week, the Illinois General Assembly put forth an alternative budget to Governor Rauner’s proposed budget that supports vital public services that enable our most vulnerable citizens – those living with disabilities – to thrive in our communities. Thresholds supports this alternative budget, HB4165, HA1, which represents a step forward in protecting life-saving services that save lives and make good fiscal sense for our state. However, elected officials must still find a revenue solution to support the spending in this budget. 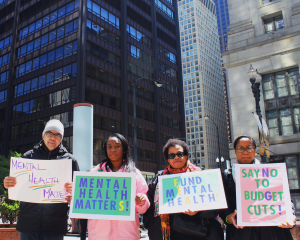 The majority in the General Assembly make mental health treatment a budget priority. For far too long this has not been the case, and we know what happens when treatment isn’t available: high rates of expensive psychiatric hospitalizations, jail time, emergency room use, and other unnecessary institutionalizations. This has led to extraordinary waste of taxpayer dollars, and an inexcusable human cost. We are encouraged and hope this signals that going forward, the General Assembly will make increased investments in mental health treatment to put it on par with other medical conditions. “Community-based mental health treatment saves lives and saves money – it’s the kind of solution our state needs desperately. This budget protects these services for our most vulnerable citizens, but we need the General Assembly and the Governor to come together to find a revenue solution,” says Mark Ishaug, CEO of Thresholds. We strongly encourage both the General Assembly and the Governor to work together to find revenue to support this budget. Further, elected officials must raise sufficient revenue to cover the actual cost of essential public services like mental health and other health care, human services, and public education that the public both demands and needs to build and maintain thriving communities. About Thresholds – Established in 1959, Thresholds provides healthcare, housing, and hope for thousands of persons with mental illnesses in Illinois each year. Through care, employment, advocacy, and housing, Thresholds assists and inspires people with mental illnesses to reclaim their lives. Learn more at www.thresholds.org. This entry was posted in News and tagged advocacy, behavioral health, budget, healthcare, Illinois, Medicaid, mental health, news, press release, Thresholds. Bookmark the permalink.